Sonlight has made a fun, challenging education possible for our children, without creating much additional work for their mother. We couldn't have successfully gotten this far without the great curriculum, wonderful books, and helpful teacher's manual that Sonlight provided. If I had to pick my favorite things about Sonlight, they would be the wonderful literature, the fact that planning and prep work are already done for me, the in-depth look at history, and the complete flexibility. Here, the G family poses on a family trip to the Badlands. This year, Beren (9) is using Core E as Helena (12) studies Core 100. After thirteen years of Sonlight, Zach (18) has graduated and is on to Ohio State University to study entomology. "Sonlight high school programs are complete and challenging," writes Sherri N of Siloam Springs, who has used Sonlight for 13 years. "Everything is outlined so that the student can proceed independently. [Once he completes Sonlight 500], Bobby (18) will have successfully used every Sonlight Bible/History/Literature program. He was still excited to unpack the books this year and thinks his senior year will be the best yet. He is well-prepared to effectively engage his world for Christ as he heads off to a competitive college. Sonlight has prepared him well with strong academics and a biblical perspective on the world." Bobby and his seven siblings have all used Sonlight every year since Kindergarten. Here, Bobbly smiles with his newly unpacked Sonlight 500 program. Sonlight is committed to meeting the needs of high school homeschool students. That's why we offer such robust high school homeschooling curriculum packages for students of every grade. We want to see students grow in their ability to think, evaluate, and analyze issues. We want students to be fully prepared for college, the work place, or any other post to which God calls them. 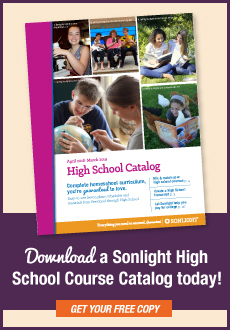 We have examined what is available to homeschoolers who are studying at the high school level, and we firmly believe that Sonlight offers the most thorough and thought-provoking high school courses available on the market today. 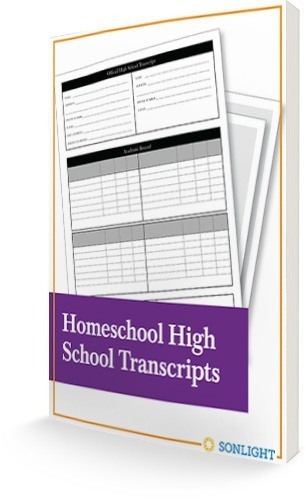 In fact, Sonlight's high school homeschool curriculum are so robust that your students may not get to everything that is scheduled for the year. And that's OK. 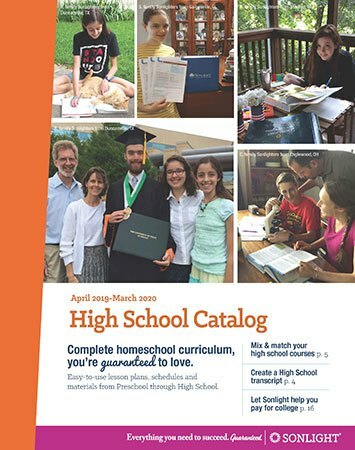 If you were to compare the scope of one of Sonlight's high school homeschooling curriculum programs to what the average classroom school requires, you'd find that Sonlight's programs include three to four times the course material! Click here to download a high school catalog. Sonlight offers a variety of courses to help your student prepare for AP exams. Click here to learn more about Sonlight's AP preparation courses. Wondering about transcripts and how classes might be applied for credit? Although Sonlight's homeschool high school courses include a lot of material, please remember that learning is not about how much material you cover. Rather, it's the process, the journey. That's why Sonlight's high school programs will encourage your students to think through difficult issues, wrestle with opposing viewpoints, and discuss significant matters. It's this educational process that will help to prepare your students for life in the "real world," away from home. No amount of knowledge can do that. But how your students interact with that knowledge and apply it will strengthen them greatly. I'm very pleased with the critical thinking skills my kids have picked up through using Sonlight. Maybe there is something inherently valuable about struggling with questions and issues and not really knowing if your answers are 'right' or not. After seeing how much better my son (who studied [the entire 400-level series]) is at critical thinking than I am, I don't worry so much. The most important thing is the process. That's what you'll get with Sonlight's homeschool for high school students curriculum. The process. A path that is rich with knowledge and thinking skills that leads to understanding and wisdom. You won't get canned responses, trite answers, or dogma — all things that are anathema to the development of critical thinking. Your high school students will soon be out on their own and with that will come great responsibility. Your children will need a significant measure of independence to be successful. While we want in no way to discourage parent-student interaction and discussion (indeed, as you should realize by now, we encourage such interaction in every way possible), we want to help your students practice independence. That's why each high school level course comes with Study Guides for both Parents and Students. Your students, equipped with their Student Guide, can do as much independent study as they like. You'll still get the same questions — and answers — in your Parent Guide. But the Parent and Student Guides are separate from each other. Your students will be able to work through the questions at a comfortable pace without being tempted to peek at the answers. At the high school level, certain elective courses are absolutely necessary. For instance, foreign language, public speaking, and money management skills. Other electives, while not necessary, are highly desirable, both from a perspective of personal enrichment and interpersonal communication skills. We strongly recommend that all high school students study a foreign language. Rosetta Stone, our foreign language program of choice, provides many. You'd be hard pressed to find a language Rosetta Stone has not made available in their interactive courses. For public speaking, we highly recommend Jeff Myers' Secrets of Great Communicators. It's a wonderful program that teaches students how to conquer their fear of public speaking, organize speeches for maximum impact, reach the heart of their audience, and deliver their speeches with confidence. Sonlight offers three resources for money management, a necessary skill for all children who plan to move out on their own: Money, Possessions, and Eternity by Randy Alcorn and Money Matters for Teens Workbook by Larry Burkett. And there are many other electives available covering Art Skills, Art Appreciation, Music, World Views, Driver's Ed, and more. You can see all our electives here. If you order any History and Bible module with any Literature and Language Arts module, that counts as a History / Bible / Literature program and you'll receive 15% off. You will also recieve SonlightCares™ benefits. 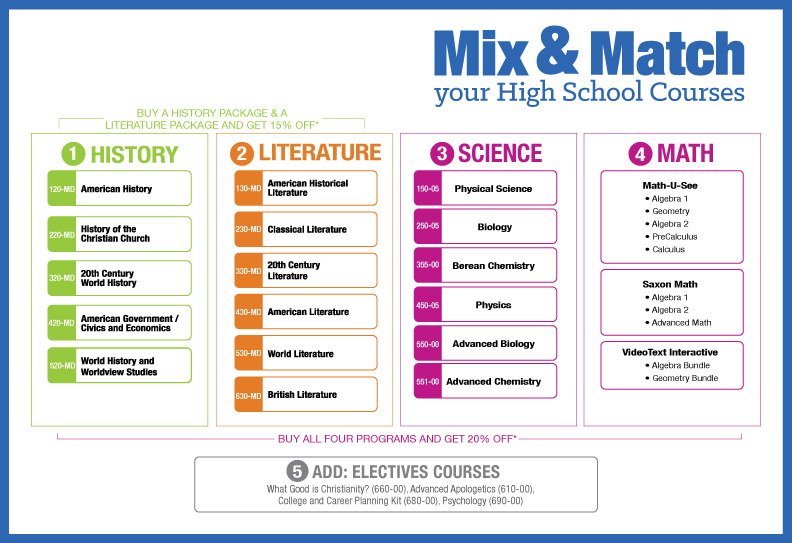 If you order a History and Bible module, Literature and Language Arts module, Science, and Math, you get the full 20% discount from an All-Subjects Package. How do Sonlight High School programs work? Like a high school course catalog, choose the programs your student needs. We designed these courses so programs work well together (120 History with 130 Literature, 220 History with 230 Literature, etc. ), but customers have used other combinations successfully. Submit the form below to download the High School catalog. We are committed to your students' success in high school and beyond. We look forward to serving you and your high school students. Below you'll find overviews of our high school courses. Level 100 can be used as a high school program even though we also list it as part of our junior high programs. Many Sonlighters begin their homeschooling for high school program with In-Depth American History which covers traditional history in thorough fashion, yet exposes students to the broader currents and finer shades of historical meaning (and the implications for today!) that a public school or textbook simply won't disclose. This course is an excellent high school option because many states require a solid year of American history for graduation. You and your child's Level 100 excursion relies on Joy Hakim's award-winning A History of US series to lead you through the highways and byways of American history. The first volume of Hakim's A History of US concentrates on pre-Columbian American societies. Later volumes devote attention to all the standard issues of history. And as you journey through Sonlight 100, our detailed Instructor's Guide allows you to relax knowing that you don't have to be an expert to educate your son or daughter. Imagine having all the work and planning done already. You will save hours of time and energy - and be able to go to bed at night without worrying about what you are going to teach the next day. Wonderful as A History of US is, and thorough as the Instructor's Guide is, Sonlight 100 would not merit the name Sonlight if it did not include a large selection of historical fiction that provides color and depth to the primary text. And so you'll find finely crafted works like Laurence Yep's Dragon's Gate and Harper Lee's To Kill a Mockingbird. Plus, to solidify your students' foundation in the Christian faith, we've included the Bible Study Sampler, a complete 36-week course designed to encourage your children to dig in and study the Scriptures on their own. Why the scientific method is inadequate for proving or disproving most questions about a person or event in history. Why it's impossible that Jesus was merely a great moral teacher. How to answer 107 critical questions about the central teachings of Scripture. Packed with navigational tools to help students voyage successfully through rough waters, Sonlight 200 explores facts and truths many textbooks just skip over. For those young people who enjoy arguments (a trait occasionally found among teenagers! ), History of God's Kingdom reveals what Protestant, Roman Catholic, and Eastern Orthodox apologists believe ... and how they argue their respective views of faith. The foundational text of this course, The Story of Christianity, is authored by a Catholic Priest and a Protestant book publisher and provides a wonderfully balanced view of the territory you will explore. A second text, The Most Important 100 Events in Christian History, organizes events and people in a chronological fashion for ease of reference and memory. The Sonlight 200 Bible course consists of catechetical and apologetics studies, including the Westminster Shorter Catechism. It also includes three lively apologetics works that were chosen for their special appeal to young people. The literary classics in this level do not necessarily coordinate with History studies, but we believe they are well worth your attention and enhance your cultural literacy. To make this part of the journey as pleasant as possible, we intermix fast-moving and humorous works among the older, more ponderous tomes. Language Arts takes you on an enjoyable journey through a complete creative writing program plus a research paper tied to your studies. Of course, you will also continue to work on your vocabulary and communication skills. Most students will find this to be a year's worth of work and possibly more. The story of the 20th Century is beckoning your teen ... with unique insight and perspective into one of the most remarkable centuries in human history, plus little-known facts that will stir wonder and curiosity. Sonlight 300 uncovers what has occurred in the past 100 years and why it occurred. Your teen will be able to identify movements, people, and ideas, and recognize their historical antecedents and consequences. The compass that will guide you on this year's expedition is the lavishly designed book The Visual History of the Modern World, which covers every major news event item from 1900-1999 with thousands of color and black-and-white photos and text written in a lively, journalistic style. The Literature course seeks both to inspire and to familiarize you with works that have helped establish Western culture's view of reality. That's why you will read lighter works like Agatha Christie's Murder on the Orient Express, alongside such culturally significant works as Kafka's The Metamorphosis and Huxley's Brave New World. The tone and color of these latter books is heavier and darker than we would prefer, but we believe Christian high school students need to prepare themselves to face the realities of the world in which they will soon be independent decision-makers and leaders. This is a great opportunity to prepare your students: especially now, while they are still at home and have instant access to your input, influence and feedback (not to mention the thorough notes in the Instructor's Guide). Besides the more literary works, Level 300 includes well over a dozen biographies, historical works and historical novels. Books like Parallel Journeys, Red Scarf Girl, and Made You Look will show you what the 20th Century was all about. 20th Century World History also comes with Literary Analysis and Creative Writing programs built in. The Instructor's guide offers two Creative Writing assignments with instructions each week: a skills-builder and a more "production"-oriented assignment. These help students with everything from defining their purpose and outlining a paper, to creating smooth transitions in time frames, and eliminating the passive voice. Through the Sonlight American Government and Economics course your teen will come to understand American civil government as it is today; not only how the government works but why it works as it does. Your son or daughter's study will begin with the cultural and historical background that led to the U.S. Constitution as written. Your child will examine the Constitution itself, and then study how the historical events and social currents of the past two centuries have altered Americans' understanding of the Constitution. Your student will spend half the year studying Economics. Demystify this poorly understood academic discipline. Discover how a better understanding of economics raises questions of modern-day theories and values. Weigh cultural and personal opinions against what we know of God and His will. The Sonlight 400 course incorporates Bible study in a way that none of our other courses do. God and Politics and Mangalwadi's Truth and Transformation lead your teen to think through issues of civil government and culture from a biblical perspective. In addition to History and Bible, Sonlight 400 also includes a complete, advanced-level American Literature component. Level 400 includes a full component of Literary Analysis and Creative Writing. The Instructor's Guide helps you to evaluate the messages of literary works you read, draws your attention to some of the techniques the authors use, and offers two writing exercises each week: one that uses a similar literary technique to that which you study, and one that asks you to interact with the content of the works you are reading. Explore the rise and fall of influential ideologies in this fascinating study from Sonlight. Give your 17- and 18-year-old (and advanced 16-year-old) students an understanding of the important ideas and philosophies that have influenced our world through the ages. Help them think deeply about issues of personal, social and ethical significance. What's more, this course will provide a platform for you to discuss together, examine and help solidify the belief system that will guide your children and ultimately serve as a lifelong compass. World History and Worldview Studies 520 is a 36-week course that provides an expansive look at history and also includes distinctive Christian commentary. Pair it with any upper-level Literature course to create the History / Bible / Literature program that best serves your students. Spanning ancient history through the start of the 21st century, Streams of Civilization, Volumes 1 and 2, anchor the history portion of the course. Written by Christian authors, these books not only provide a beautiful historical overview, but also weave in unique insights and analysis about science, music, art, architecture, pop culture and other topics of interest throughout.